For the first time ever, Dunkin' Donuts has partnered up to create a beer inspired by the chain's coffee. Since it's fall, you may have guessed where this is headed. It's the flavor as omnipresent as oxygen ... pumpkin. It's basically a pumpkin spice latte beer. Catawba Brewing has crafted a cold-brew, pumpkin-flavored beer it is calling Dunkin' Punkin Brown Ale. The beer was launched Friday for National Coffee Day. As tired as you may be of the Pumpkin Spice Life you're living every fall, this shouldn't be tossed in the pile of over-the-top pumpkin refuse. (Pumpkin spice lattes for dogs, anyone?) There are lots of solid pumpkin beers out there like Jack-O-Traveler pumpkin shandy, Rogue's Pumpkin Patch Ale, or Southern Tier's Pumkin Imperial Ale. “Craft coffee is at the core of our business so we like to brew up something for National Coffee Day that really delights our customers. 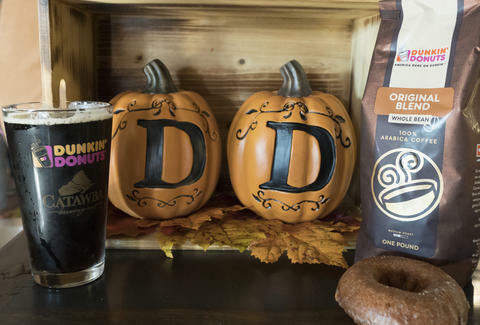 That’s when we hatched an out-of-the-cup idea -- combine craft coffee and craft beer,” said Meaghan Duff, field marketing manager for Dunkin' in North and South Carolina. “To give it the local flare, we partnered with an established, family-owned brewery with a mission that caught our attention -- create unique, small batch beers inspired by our communities and lifestyle." If you feel a strong urge to get this brew in you, you may have to travel. It's only available at Catawba's four tasting rooms in North Carolina. They brewed 20 barrels and once it's gone, it's gone. On the bright side, when you order another round, you can use the excuse that you're doing it for a good cause. A dollar from each beer will go directly to help North Carolina's Second Harvest Metrolina.